This exhibition mines Radical Software, the first periodical devoted to video, to present a survey of some of the very earliest video art in existence. In the earliest days of video, the lines between art, documentation, journalism, and experimentation were either not yet existent or intentionally blurry. The community of exchange that Radical Software facilitated was notable for the unusual intersection of hybrid practices and ideologies including radical pedagogy, feminism, left activism, gonzo journalism, experimental art, and erotica. 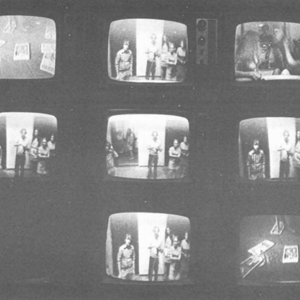 This installation is in the spirit of the early 1970s Friday-night video screening parties held in the Prince Street SoHo loft inhabited by members of the video art collective Videofreex. Included are works by Videofreex, Raindance, TVTV, Ant Farm, John Reilly, People’s Video Theater, and Ladies Home Journal.